Tessa Longbons | November 28, 2018. 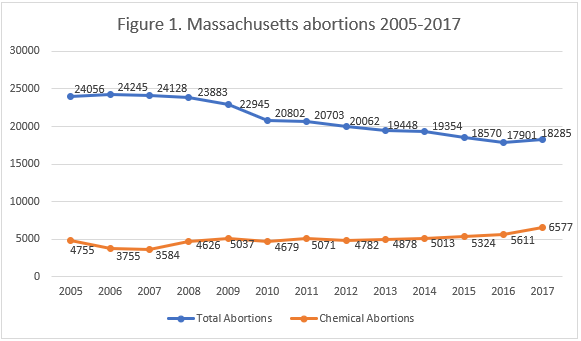 Massachusetts’ annual abortion report, provided to the Charlotte Lozier Institute in July 2018, shows that chemical abortions in the state are rising. Planned Parenthood continues to perform well over half of the abortions reported in Massachusetts. *Information on Massachusetts’ state abortion rate is not publicly available. In 2017, there were 18,285 abortions reported in Massachusetts, an increase of two percent from the previous year (Fig. 1). Of these, 6,577 – or 36 percent – were chemical abortions. Chemical abortions rose by 17 percent from 2016 and by 500 percent from 2001, the first year after the U.S. Food and Drug Administration approved the use of Mifeprex as an abortion drug. Over the same time period, reported abortions overall have declined by 30 percent in Massachusetts. 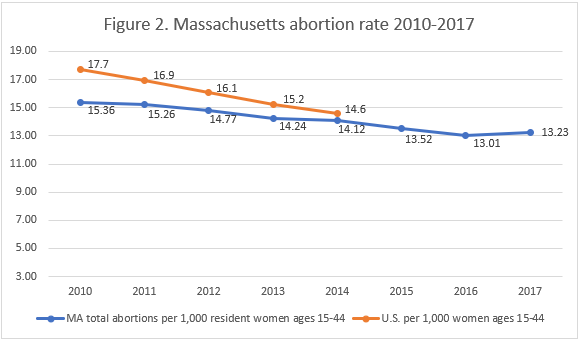 Massachusetts does not report the state abortion rate, but CLI estimates that the 2017 abortion rate was relatively unchanged from the previous year at 13 abortions per 1,000 resident women of childbearing age (Fig. 2). The vast majority of the abortions reported in Massachusetts, 96 percent, were performed on state residents. Three percent were performed on nonresidents, and 149 abortions were performed on women of unknown residence. As in other states, more than half (56 percent) of the women getting abortions in Massachusetts were in their twenties. Thirty-two percent were in their thirties, while just four percent were age forty or older. Eight percent were under the age of 20, including 26 girls younger than 15. White women made up the largest racial group, undergoing 47 percent of reported abortions, and 18 percent of abortions were performed on black women. Twenty-six percent were performed on women of another race and six percent on women who did not report their race. Statewide, white women make up 79 percent and black women make up 11 percent of the population of women between the ages of 15 and 44. Most abortions were performed on women who had graduated from high school but did not have a college degree – twelve percent reported high school as their highest level of education, and 11 percent had completed some college but had not yet graduated. Thirteen percent were performed on women who had an associate degree or higher. Five percent of the women had not finished high school, including 141 women with an eighth-grade education or lower. Seventy-one percent of the women were not married, and 19 percent were married, although marital status was not reported for 10 percent of the women getting abortions in Massachusetts. Many women had previously given birth. Twenty percent of the abortions were on women who reported one previous live birth, and 25 percent on women who reported two or more, although 13 percent did not report whether they had given birth before. Half of the women getting abortions reported it as their first abortion. Twenty-seven percent had already had one previous abortion, and 19 percent had more than one. Four percent did not report whether they had already had an abortion. Planned Parenthood is the largest abortion provider in Massachusetts. In 2017, Planned Parenthood’s Massachusetts centers were responsible for 10,503 abortions, more than 57 percent of the state total. Massachusetts’ report reveals that 14,447 of the abortions reported in the state were performed in clinics, with the remainder performed in hospitals and doctor’s offices. Planned Parenthood performed 73 percent of clinic abortions. In 2016, Planned Parenthood performed 10,349 abortions in Massachusetts, 58 percent of the state total. Currently, Planned Parenthood operates five centers in Massachusetts, of which three advertise abortions. The other two give abortion referrals. In a Charlotte Lozier Institute study of state abortion reporting, Massachusetts received a low score for failing to make its abortion reports publicly available. Massachusetts could make its reports more accessible by posting them on the website of the state’s Department of Public Health, as most other states do. Massachusetts is transparent with its reports, reporting most of the information it collects. However, the state does not report any data on abortion complications, even as chemical abortions – which have a higher rate of complications than surgical abortions – continue to rise. Massachusetts also does not report how abortions were paid for and whether women gave informed consent. Massachusetts does not collect or report any information on women’s reasons for abortion, the physical characteristics of the babies killed by abortion, or whether any babies were born alive. By reporting these and other data points and making them more accessible, Massachusetts could make its abortion reporting more useful for citizens and researchers alike. Massachusetts does not report the state abortion rate. Rates were calculated by the Charlotte Lozier Institute using population estimates from the United States Census Bureau. The rates were calculated using the following formula: (total number of abortions performed in Massachusetts ÷ number of resident women ages 15-44) x 1,000.